With its C-5M engine’s record-setting history and other industry achievements, GE Aviation has delivered effective capabilities for Warfighters through its sustaining, upgrading, and re-engining efforts. Karl Sheldon is Vice President and General Manager, Evendale Turbofan/Turbojet Department, GE Aviation, responsible for leading strategy and activities for the military combat engine segment as well as its derivatives and commercial applications. A&M: How is GE helping the USAF improve the effectiveness of their airlift/tanker fleet? Mr. Sheldon: GE is always working with the Air Force on ways to improve engine performance and deliver for the Warfighter. Through sustainment efforts, upgrades and re-engining programs, we’ve been able to increase engine performance and meet the evolving needs of the Air Force. GE has also been able to drive down life-cycle costs by making engines more fuel-efficient and more reliable with decreased maintenance costs. A&M: What experience does GE have with re-engining aircraft? Mr. Sheldon: GE has successfully re-engined Air Force aircraft three times: the Lockheed C-5 Galaxy, the Lockheed U-2 Dragon Lady, and the Boeing KC-135 Stratotanker. GE’s F101 turbofan engine, originally developed in 1974 to power the B-1 Lancer, evolved into the CFM56 commercial engine and became the best-selling narrow-body engine in history. The Air Force then selected GE to re-engine the KC-135 with CFM56 engines in 1984 and leveraged technologies developed commercially in a core upgrade program, further improving performance and fuel efficiency. Additionally, GE’s TF39 turbofan engine for the original C-5 in 1968 led to the CF6 commercial engine, the world’s best-selling wide-body engine. 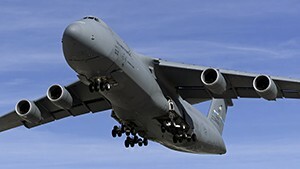 The new technology developed for the CF6 came back to the military when GE re-engined the C-5 in 2004, creating the C-5M Super Galaxy. GE’s proven experience evolving advanced technologies between the commercial and military communities brings the greatest engine performance and cost savings. A&M: Can you tell us about the benefits that have come from re-engining the C-5? Mr. Sheldon: The C-5M’s incredible performance improvements earned it a nomination for the 2015 Collier Trophy. The nomination package included a quote from General Carlton D. Everhart II, commander of Air Mobility Command: “The C-5M is a game changer for Air Mobility Command. With unprecedented performance and reliability, it is rewriting how we move America’s might around the world.” The re-engined C-5 set 89 world records (the most by any single aircraft) and has 27 percent greater unrefueled range, 22 percent increased thrust, access to twice as many airfields, 40 percent better mission capable rate, and three times reduced maintenance man-hours. The vastly improved reliability of the C-5M decreased its logistical footprint, requiring less personnel, less spares, less tooling and less depot visits. This re-engining enabled greater tanker availability for other missions and provided the confidence to utilize the platform in flexible ways as the combat environment and needs of the Warfighter continue to change. A&M: Are there other re-engining programs on the horizon? Mr. Sheldon: The Air Force has expressed interest in re-engining the Boeing B-52H Stratofortress, a timeless warrior for the Air Force since the 1950s. The Air Force wants to sustain the B-52 past 2050, and GE has two great options: our CF34 and Passport engines. GE’s CF34 engine is the best-selling regional engine in history. Similar to the CFM56 engines for the KC135, we upgraded the CF34 with generations of technology. The latest model, the CF34-10, entered service in 2006 and now has 26 million flight hours of experience and a 99.96 percent dispatch reliability. It’s no surprise that CF34 engines power 98 percent of Western-built regional aircraft delivered in the past 10 years. Our other option is the Passport engine, currently scheduled to enter into service later this year on the Bombardier Global 7500 and Global 8000 business jets. The Passport engine offers the newest technology, proven through a rigorous development and test program. Both engines offer significantly better fuel burn rates, enabling increased range and time on station. Both of these engines also ensure no scheduled shop visits through 2060. We look forward to working closely with the Air Force and delivering the best results possible.